"Slang, however one judges it, shows us at our most human. It is used widely and often, typically associated with the writers of noir fiction, teenagers, and rappers, but also found in the works of Shakespeare and Dickens. It has been recorded since at least 1500 AD, and today's vocabulary, taken from every major English-speaking country, runs to over 125,000 slang words and phrases. This Very Short Introduction takes readers on a wide-ranging tour of this fascinating sub-set of the English language. 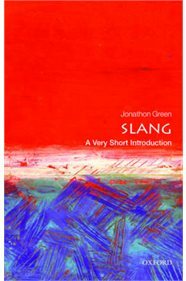 It considers the meaning and origins of the word 'slang' itself, the ideas that a make a word 'slang', the long-running themes that run through slang, and the history of slang's many dictionaries. ABOUT THE SERIES: The Very Short Introductions series from Oxford University Press contains hundreds of titles in almost every subject area. These pocket-sized books are the perfect way to get ahead in a new subject quickly. Our expert authors combine facts, analysis, perspective, new ideas, and enthusiasm to make interesting and challenging topics highly readable."